3rd BMS Xmas Trophy won by Ronny Conaert (result) and Michel Lamote (PR). Now with complete PR ranking. 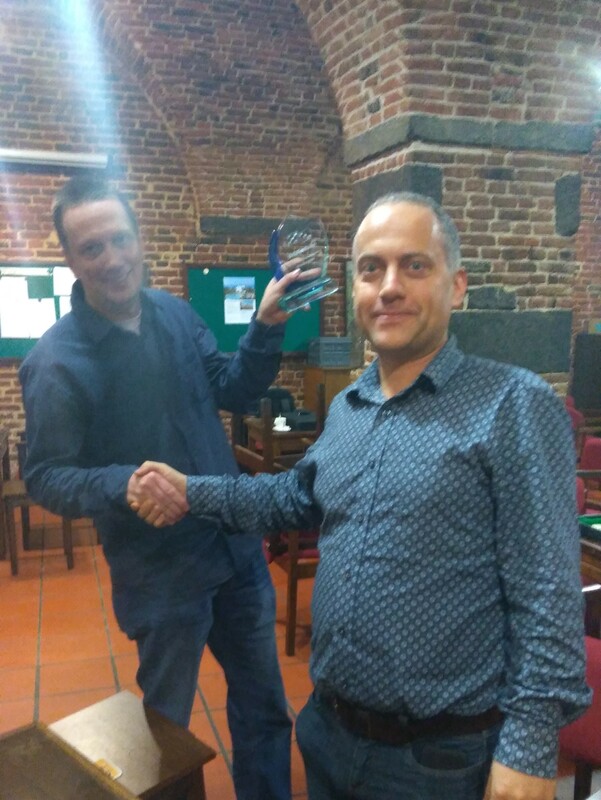 On Saturday 29 December 2018, fourteen players competed in the Sandeman Club in Gent for the 3rd BMS Xmas Trophy. Almost the complete top-12 of the BMS Grading Table was present to try and play as best they could. Ronny has been a dedicated backgammon student and expert player for years. Recently he has upped his efforts to improve by playing challenging Master Series against strong opposition. On Saturday, he proved his mettle by winning five medium-length matches in a row, showing stamina and will to win. Congratulations, Ronny! PR 1. Michel (5 x 9). Scores 2/5. PR 2. Geert (5 x 9). Scores 4/5. PR 3. Marc (5 x 9). Scores 2/5. A good PR not only depends on skill, but also on circumstantial luck. There are easy matches and difficult ones, matches with a high DD (= degree of difficulty) and with a low DD. If you have the bad luck of finding yourself in backgames or notoriously difficult prime-vs-prime positions, you may well see your PR deteriorate quickly. This may explain the reverse order of this top-3, where Michel played 0,5 PR better and Marc 0,5 PR worse than their true PR. Just behind this trio come 4. Misja Alma (N) (PR 5,06) and 5. Tilman Söhnchen (GER) (PR 5,16). Then we find the four players who occupy places 4 to 7 on the BMS GT: 6. Paulus Van Rooijen (N) (PR 5,65), 7. Johan Segers (PR 5,70), 8. Paul Van Dijke (N) (PR 5,90) and 9. Johan Huyck (PR 5,91). These are excellent PRs by all four, indicative of significant progress and sustained focus on the day. Also 10. Luc Palmans (PR 6,53) and 11. Ronny Conaert (PR 6,96) did not disappoint and can be proud of their performance. 12. Guy Van Middelem (PR 7,92) comfortably played at par, but somehow seems to have missed an opportunity to excel. 13. Robin Bilderbeek (N) (PR 8,70) appears to be the only player in the field who failed to impress. Robin certainly made progress in recent months, but could not find his best form. 14. Steven Hoeylaerts (PR 9,39) certainly deserves praise for this performance. Having picked up the game less than a year ago, his learning curve has been steep and this below-10 PR is proof of that. All in all, this field of ambitious students of the game played extremely well, achieving an average PR of 6,16 (35 x 13). Belgium’s top-3 were able to stave off a valiant assault by two accomplished Dutch and German competitors as well as by their four closest pursuers on the BMS GT. Below them, Luc, Ronny and the others confidently consolidated their top-10 status. Check the BMS GT in the black banner above to see the current standings. 1 Response to 3rd BMS Xmas Trophy won by Ronny Conaert (result) and Michel Lamote (PR). Now with complete PR ranking. how long do we need to become a pro player?